overstating a bit too much maybe? Should be 5000 fans from Winnipeg there. Oh yeah!! "The loudest crowd roar at a sports stadium is 142.2 dbA and was achieved by fans of the Kansas City Chiefs, at Arrowhead Stadium in Kansas City, Missouri, USA, on 29 September 2014." Been to three great games at Arrowhead, great atmosphere for sure!!!! T-Mobile playoff game better though. No one had the balls and stuck there neck out on the line like I did with this one. To me, it was.... and is a slam dunk. No one had the balls and stuck there neck out on the line like I did with this one. Stated on many forums the NHL would be successful here. This has been a good hockey city for years, tons of transplants here that love their hockey, throw in the great road trips for visitors to catch a game, this was really a no-brainer. THEN, throw in the success of the team, what a PERFECT STORM. Thought this before knowing how great a venue T-Mobile has turned out to be also, another huge plus.............everyone that comes to Vegas should make a point to try and catch a game there if NHL in season, terrific in all aspects. You obviously were not paying attention before the season started here. You didn’t post in any of the threads here. lots of bandwagon fans like you who hop on board the train after it already starts to roll. I live in Vegas, you don't. Back to your corner son. This made me laugh. Superbowl in game atmosphere blows. 1/2 the crowd is corporate people with no rooting interest in the game. The other 1/2 is lulled to sleep by the continuous lengthy commercial breaks. A T-mobile regular season game against the Panthers would have a better atmosphere than any Superbowl. Over the years I prolly glanced at over 1000 posts by Fishhead. Maybe more. Can count on one hand the number with hockey in them. No more than 10. He watched a few games in Tampa back in the day. Now a team moves to Vegas, someone springs for a ticket in one of the suites with free food and all of a sudden. He’s the hockey whisperer. Hes is a funny guy sometimes that Fishhead. Only reason we’re seeing Fish post so much here of late is they ran him out the TGF. How ironic hes he’s bringing up someone getting but hurt. Couple guys over there hurt his feelings and he took his username and went home. Now we’re all blessed with the dumpster diver here for a while. A +ev experience for all. Here. Why don’t we start with these 2 threads here Fish and let’s count how many times you chimed in on this topic compared to me. And while we’re at it, it sure is fun to read the guys in these 2 threads who think they have a clue and who talks out of their assholes when they speak. Couple of the better ones are Railbird and Fezzik, lol. Pure +ev knowledge they were throwing our way! The others I won’t call out out of respect. Ray. I’m talking about you! Ohh. I left out resident sharpshooter Johnny Knuckles. He posted a real gem himself. I believe this was one of our first signs the knuckster was feeling froggy and jumped into a trread here at EOG! Lol. More proof this dope belongs back at Covers forum. Think that’s where Winky got his start too. Fishy is this true? I heard Fish won over 25K at the Gambling Forum. Too top it off they wouldn't let Billysink participant in the juicefree betting? Seems to be the consensus over there anyways. I don’t post over there but will scan the 1st page a few times a month for something interesting. I read it today there myself. That's because it's all on paper. Screenshot of ledger please. You can redact names. Geez, must be like getting the Nobel Peace Prize -- OK, not the best example for being awarded for actual accomplishment over the past decade or so -- or finding a cure for cancer. Turned out they didn't offer much.................on the flipside, TheM offered up luxury game suites with food and beverage provided. LAS VEGAS — Mathieu Perreault walked to T-Mobile Arena for Wednesday’s morning skate from the Winnipeg Jets’ team hotel, but he didn’t walk down the famous Strip. “I went the back way,” Perreault said. It felt different because you can’t walk five feet here without seeing a Vegas Golden Knights logo. Vegas is a hockey town – and has been that way since the puck dropped in October – but that fact is amplified when you look around. If you don’t immediately spot someone in Golden Knights gear, you’ll see the team’s name and logo plastered on an old-school casino marquee. Wednesday night marks the single biggest professional sports game ever played in the state of Nevada and you can feel it. 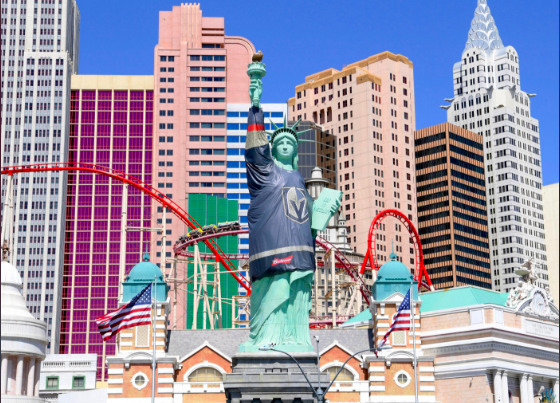 Lady Liberty is dressed in gold in front of the roller coaster at New York, New York Hotel and Casino, which is just steps from T-Mobile Arena, home of the Golden Knights. 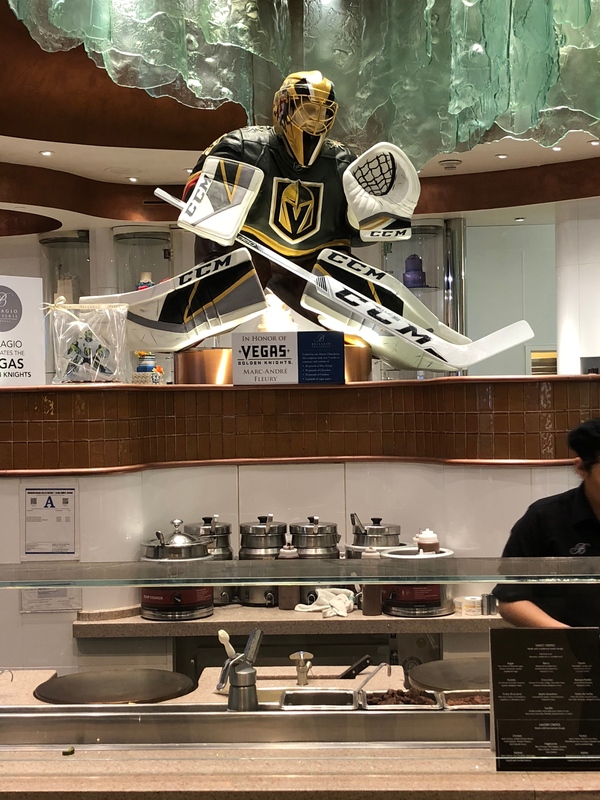 A life-size Marc-Andre Fleury was sculpted out of 90 pounds of chocolate, fondant and Rice Krispies treats at the Bellagio. 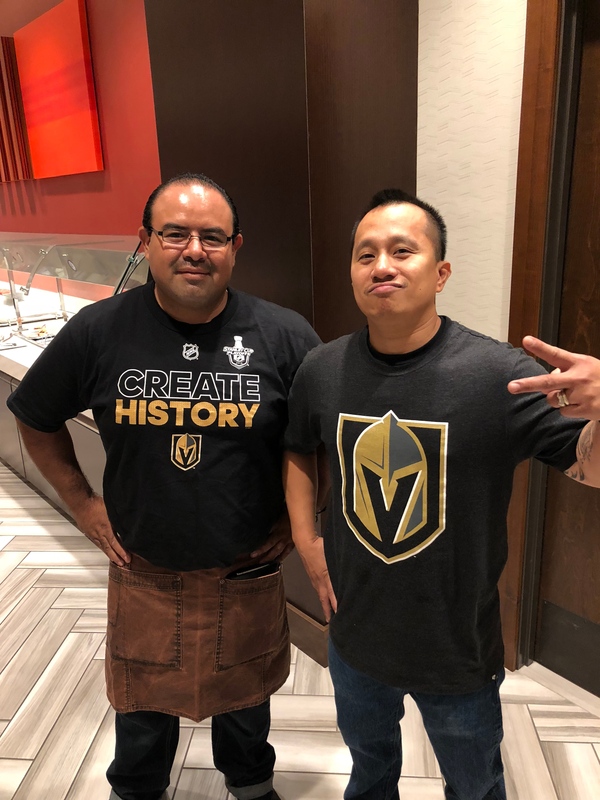 Meet Pedro and Jonathan, servers at the Westin Hotel who hail from San Diego and the Philippines, who had never seen a hockey game before this season but now are die-hard fans. Almost everyone is wearing Golden Knights gear at work. 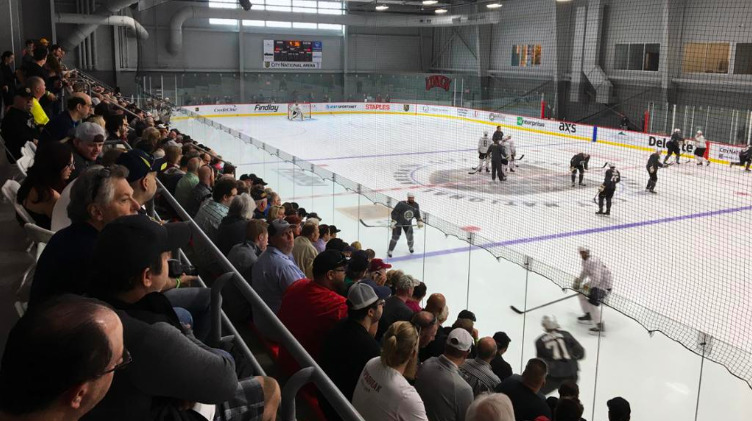 It was another standing-room only crowd – on a Wednesday morning – for the Golden Knights’ brief skate at their practice facility in Summerlin, Nev., about a 25-minute drive from the Strip. Missed the game tonight. Just watched the highlights. Looks like Fluerry stole the show. Again. Jets need to steal one in this building or this series is over. As of this morning the cheapest tickets for Wednesday’s games can be had in the $330 range. Friday’s game, (next week), going for $370. Prices won’t go any higher, only lower closer to game time. Unless the Knights sweep the first three and have a possible clinching game on Friday. Which can’t possibly happen. No chance, Zero. Just like there was no chance in hell an expansion team could make the playoffs to begin with. Picked up 2 lower bowl for $91 each tonight. Noticed prices starting to drop yesterday. Went down to Toshiba plaza, had a beer and watched the vivid seats app waiting to pounce. Plenty of tix under $100.